Surprisingly, it's rare that a puzzle app developer gives a great description of their app. This is one of them, below. I think it's unique and fun. Am I addicted? No. But this is good! I've played it 8 times. I enjoyed it. 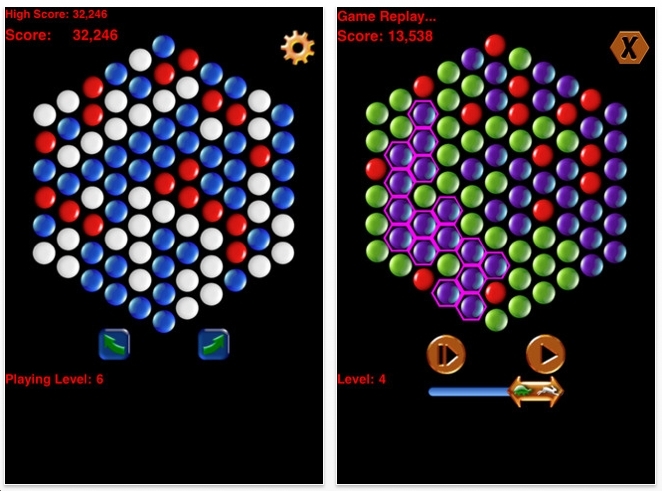 "Crystal Sliders is a deceptively simple but fun and challenging new puzzle game! Your goal is to remove all crystals from a starting arrangement by selecting groups of two or more adjacent crystals of the same color. The larger the group removed at once, the larger your score. But there's a twist: the remaining crystals slide and form new groups depending on which of six directions you've rotated the board. At the beginning of a level, you can have well over a hundred possible choices, affecting which groups you'll be able to remove later. Choose wisely! The game is easy enough for anyone to learn to play, yet deep enough to interest anyone. Just touch a crystal to select all adjacent crystals of that color. Touch again to remove the group, or rotate the board any direction you want first. Think ahead to see what new pattern your move will create. The easiest level has only two colors. 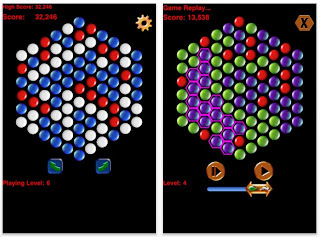 Later levels add more colors to increase the challenge. You can immediately tell your friends when you beat your high score - or theirs! You can Replay every move you made in the current game. Crystal Sliders also saves your top twenty high scores and allows you to Replay any of them later, showing every move you made from the beginning to the end."